Hail him, New Yorkers! 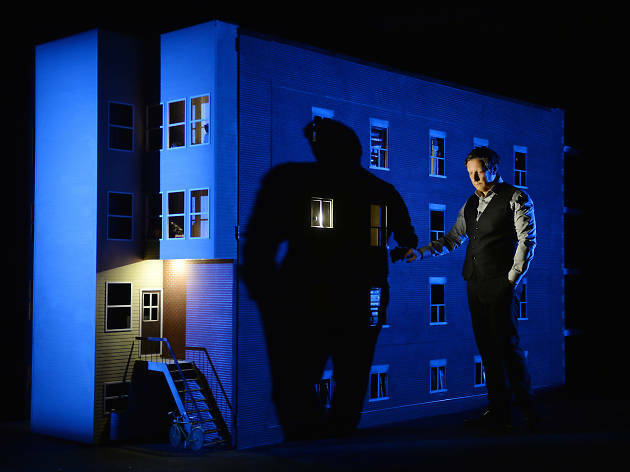 Canadian director Robert Lepage has returned to the BAM Harvey in triumph. And if the world were just, it would be a literal Triumph—we'd parade him on a float down Atlantic Avenue, tribute piled up around him, captives wailing at his feet. There was, admittedly, a wobbly moment there (namely, The Blue Dragon in 2013) when Lepage seemed to have traded something precious away for a continued mastery of the visual image. But in the heart-stoppingly gorgeous 887, the auteur is deft and perfect again, meshing reminiscence and images together with a watchmaker's care. 887 seems to be five things at once: an autobiographical monologue, a cabinet of wonders, a Platonic model for multimedia work, a poetic investigation into memory and—at least for those of us who don't know Quebec City—a history lesson. It begins with Lepage noting his own failing mind: He tells us that, in 2010, he was asked to recite a poem at a gala, but his brain wouldn't cooperate. Lepage introduces the notion of the “memory palace,” an ancient trick in which one can “store” thoughts. For his palace, Lepage has chosen his childhood apartment building, which appears behind him, an exquisite nine-foot-high model. He gives us an unhurried tour; as he introduces them, neighbors and family members appear via ten-inch videos in the windows. This dollhouse apartment building, 887 Murray Street, is only one of the set-unit's incarnations. It also opens like a puzzlebox to become Lepage's human-sized kitchen, where he badgers a friend in the news business about what the CBC has planned for his obituary, a garage where he metamorphoses into his cabbie father listening to the radio, and a diner, where that same father rearranges the letters on a magnetic menu. The whole structure is an avalanche of associations that take us both into painful personal memories (the father adjusts “poutine” to become “routine” just before Lepage starts talking about his mother's sense of abandonment), and Lepage's growing recollection of the separatist movements that surrounded him growing up. Here, the images tell the tale. For instance, there's a dollied onstage camera shot that glides at ground-level between two heavy boots. Just this projection conveys—better than any narration—the brutish '60s attitudes towards the often poor Francophone Québécois. Then, after a hundred minutes of watching Lepage interlock the five forms, 887 turns into something else. All through the show, Lepage has been hinting at it, teasing us with it, and then, finally, he recites Michèle Lalonde's incendiary 1968 poem “Speak White.” (The phrase is the Canadian English-speaker's slur against those who insist on speaking French.) Bang! The gentle memory show combusts into a political cri de coeur. Details from earlier in the play explode like timed charges; Lepage's gentle, self-mocking tone goes black with rage. We realize the memory palace trick has worked, though perhaps not as Cicero would have intended. By remembering public and private injustice from the past, Lepage has tapped into the fury under the poem, and this has burned it into his mind. You leave, at least partially knowing how he felt. A day later, I can still feel the show smoldering its way through my synapses—searing its way into being unforgettable. BAM Harvey Theater. 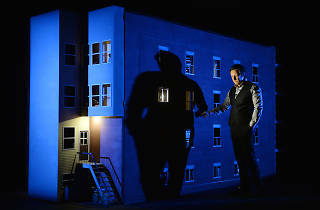 Written, directed and performed by Robert Lepage. Running time: 2hrs. No intermission. Through March 26.